Halloween marks the beginning of the holiday season for us humans, but did you know that next to the 4th of July, Halloween is the most dangerous time of year for our pets? Toxic treats, ringing doorbells, front doors opening and closing for people in spooky costumes shouting “trick or treat”, pranksters, and dangerous decorations make Halloween a potentially very dangerous holiday to our beloved felines. Many cats escape out that opening and closing door, ingest toxic Halloween candy, or devour small parts of Halloween decorations in their own homes. Here are some tips to guarantee your kitty has a safe Halloween, because nobody wants to end up in the Animal Emergency Center on Halloween night. 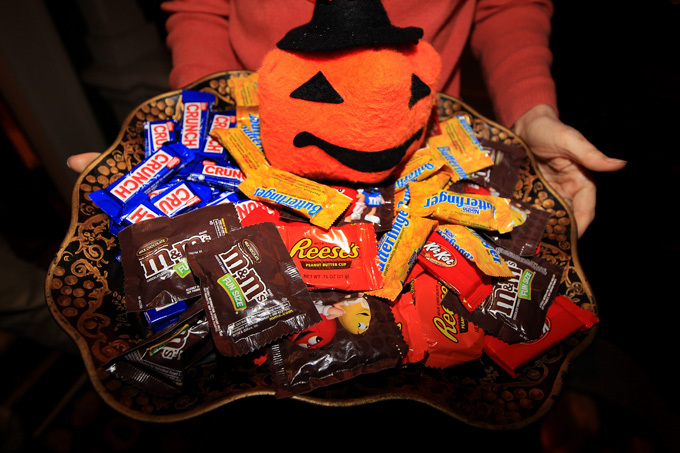 Halloween candy is delightful for children but highly toxic for cats. If your cat consumes Halloween candy, it could lead to diarrhea, vomiting, seizures, an abnormal heartbeat, or death depending on the amount consumed. Be sure to have the phone number for the ASPCA Animal Poison Control Center handy this time of year, and always know the location of your nearest 24 Hour Animal Emergency Clinic. Many cats are afraid of loud noises, and their stress levels can increase significantly when the doorbell is ringing every few minutes for hours on end, like on Halloween. You may not realize this, but loud music from a Halloween party and motion sensor Halloween decorations that shriek or howl at the slightest movement can really cause a lot of stress and anxiety to a cat, especially a sensitive or shy cat. Noise anxiety may cause your cat to exhibit behaviors like urinating or defecating outside the litter box and other destructive behavior. Some older cats can even have sound-induced seizures. 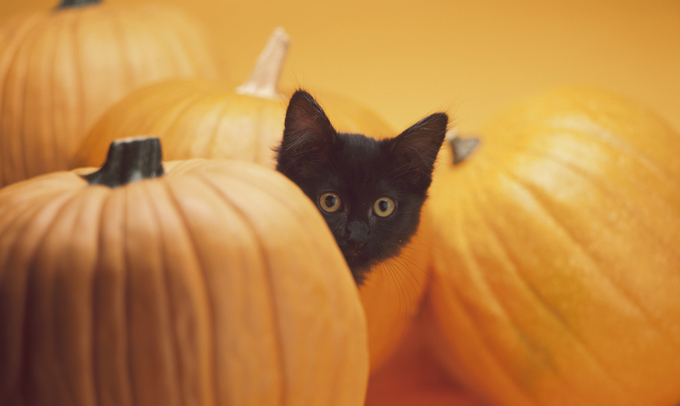 Make sure your cat is confined to a small, safe place in your home on Halloween night. Try to find a location as far removed from the noise and action as possible. Another great way to keep stress levels down is to take a chair and sit outside your front door to hand out candy. That way, nobody will be coming up to your door or ringing your doorbell. Invite a few friends over and play some music. You’ll have a blast out front talking to your neighbors, enjoying the change in weather, and your cat will avoid the stress of Halloween all-together. If you’re having a Halloween party, create a safe space for your cat in a room that is as far away from the noise as possible. Shut the door and hang a sign on it warning people not to enter the room. Lock the door if possible, and ask your guests to avoid that part of the house. If you have a cat who likes to escape though open doors and windows, Halloween can be a very dangerous time. Many cats end up lost, in shelters, or injured on Halloween night because they run out the door when their humans are distracted with handing out candy. This is another great reason to keep your cat confined to a safe area of your home, but it’s also important to make sure that your cat’s microchip information is up to date and that your cat is wearing ID tags if possible. If your cat does escape, be sure you know what to do to find your lost cat as soon as possible. 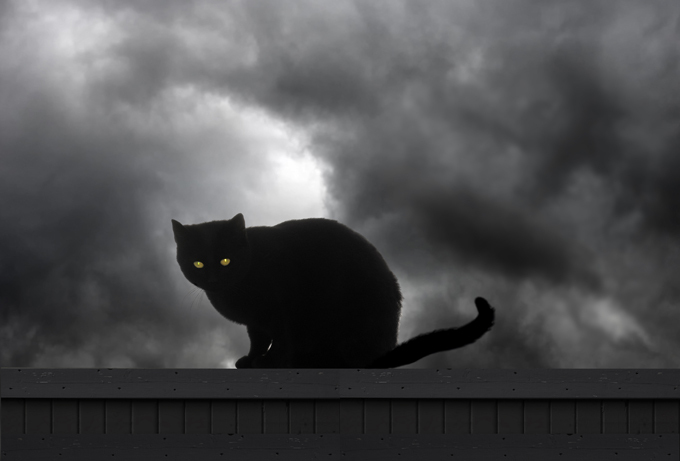 All cats are at a higher risk this time of year but especially black cats. According to the popular website snopes.com, it is a sad but true fact, and they quote many reliable sources on their website. Long associated with witches, bad luck and the dark side, black felines are often used for pranks, party props and even satanic, sacrificial rituals around Halloween. “This is a time when blood rituals take place,” said Hedy Litke, director of animal placement at the ASPCA. “Black cats are often sacrificed.” Such is their popularity that many shelters in New York and around the country ban adoptions of black cats in the weeks and days preceding Oct. 31 to protect them from potentially grisly endings. Halloween catnapping commences as early as late August and goes through the month of October. People even adopt black cats to use as living Halloween decorations only to abandon them after the Holiday has passed. Many shelters and rescues halt black cat adoptions this time of year to protect the animals. Some say that the rumors of feline abuse this time of year are blown out of proportion, but it’s always better to be safe than sorry. 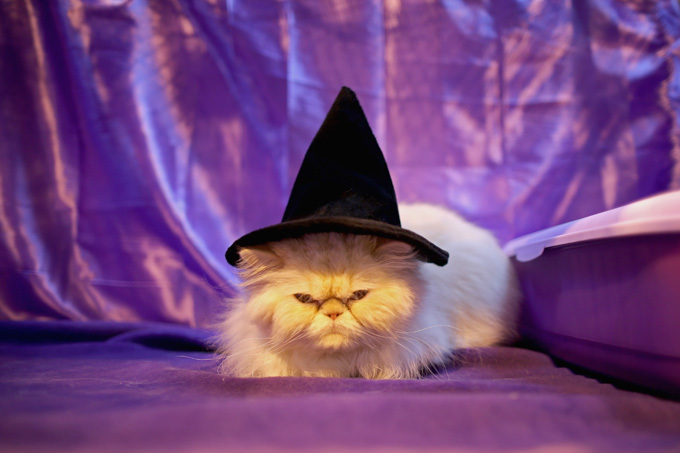 It can be really tempting to dress up your cat in a Halloween costume, but a lot of cats just don’t like it. Before you dress up your cat, take a step back and think about your cat’s personality. A shy, skittish cat will likely hate wearing a costume. An outgoing cat who’s been dressed up since they were a kitten might be fine with it. Just remember, don’t force your cat to wear a costume. If they resist, let the idea ago. If they’re OK with it, make sure you don’t put on anything that restricts their ability to sense the world around them. Cats interact with their ears, whiskers, tails, paws, and nose, so make sure these aren’t covered up. Never leave a costume on a cat or any other animal unattended. Remove the costume as soon as you are done taking your photos or video so the cat can get back to being a cat. 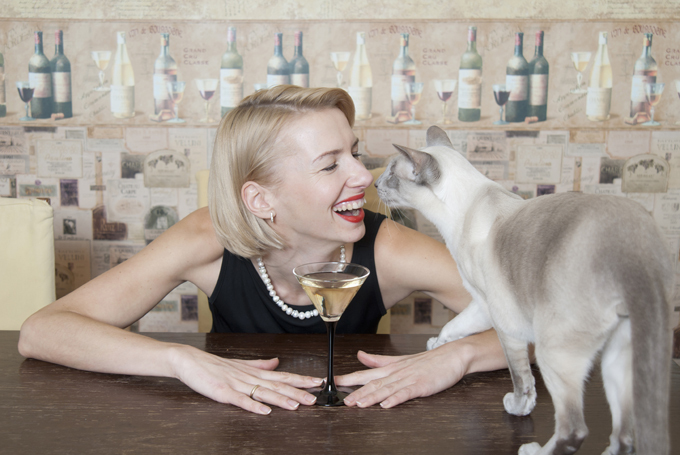 Your guests, especially children, might not know the right way to interact with your cat. If you let your cat roam during a Halloween party, make sure you lay some ground rules for your guests. Tell them not to give any candy or food to your cat. Teach any children who are visiting not to grab your cat, but to treat kitty with respect. Show them what your cat does or does not like. If your cat is shy, ask your guests to leave your cat alone. And if your shy cat does approach them, tell your guests to just extend their hands slowly for a sniff. Many shy cats won’t want strangers to pet them. It’s always best to secure your shy or more sensitive cat in a safe and isolated part of your home during a loud party. These fires caused 86 deaths, 827 injuries and $374 million in direct property damage. Candles caused 3% of reported home fires, 3% of home fire deaths, 6% of home fire injuries, and 5% of the direct property damage from home fires during this period. 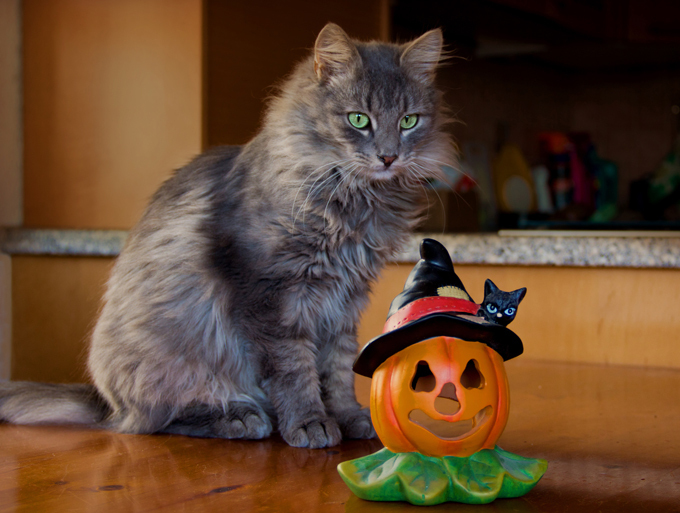 A lit jack-o-lantern or candle may be tempting for your cat to play with and poses a serious fire hazard if kitty knocks it over. Many other Halloween decorations pose a serious threat to cats this time of year. Wires, glitter, strings, feathers–so many parts to these home decorations are just too tempting to a kitty. 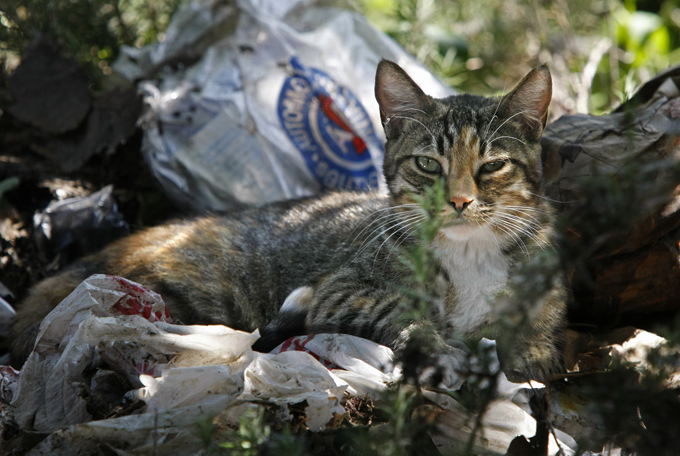 Even deflated balloons or candy wrappers can be dangerous if your cat ingests them. You don’t want your cat eating something that might create an expensive trip to the vet or worse. Halloween is fun for us humans, but dangers lurk all around for our kitties. Just be sure that you are educated and aware of what your cat is playing with and what your cat has access to. If you notice your cat playing with something that is potentially dangerous, it’s better to get rid of that decoration. Also make sure your cat has plenty of toys of their own to play with to distract them from the Halloween stuff. Share these tips and spread the word to keep cats safe this Halloween. Let us know how you protect your cat on this holiday in the comments below!